The half size Burrell Gold Medal Tractor makes an excellent stable mate for the half size Little Samson. The increased complexity makes it suitable for the experienced builder, or those with a little more time. 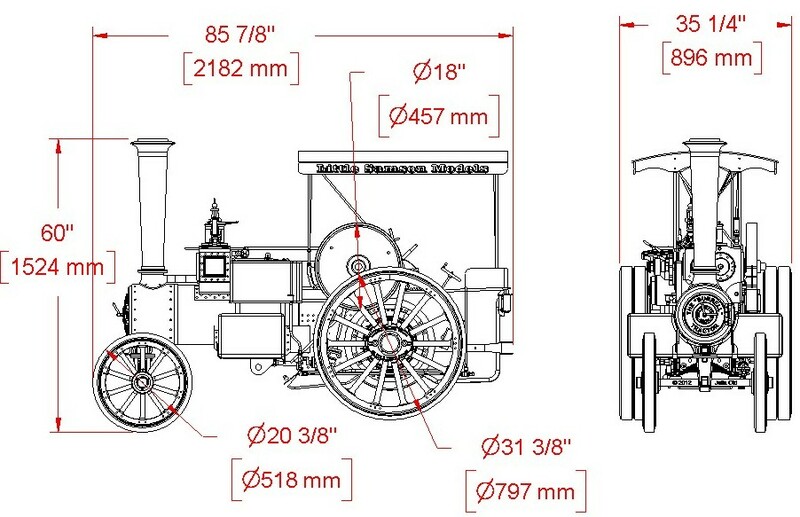 The Burrell Gold Medal is a charming model, the proportions of Burrell engines being widely accepted as amongst the best engines built. The model is a compound, has three speeds, and is sprung on the front and back axles. The third speed gives it a fine turn of speed where the road conditions allow (tarmac and good visibility). Rim brakes are fitted. The vast majority of full size Gold Medal Tractors were fitted with two injectors. However the intention is to fit a mechanical pump, which happily is geared down for superior performance and quieter operation. Works drawings for the mechanical pump are one of very few I do not have, but are I believe available from the Museum of English Rural Life; least ways I have the drawings numbers and they refer to the GM pump. The cast iron cylinder will save the builder a great deal of time. All the steam ways are cast in making the job of machining much easier. Overall length of model: 7' 0"
Overall width of model: 2' 11"
More on this page to follow.